Genuine OEM HP Toner Cartridge, Cyan, High Capacity 4,000 page yield. HP part number: Q3961A, 122A Cyan. Color Laser Toner Cartridge compatible with HP LaserJet 2550, 2820, 2830, 2840. The product is what we need and saves the company money. It arrives in a timely fashion and saves me a trip to the office supply store. Remanufactured HP Toner Cartridge, Cyan, 4,000 page yield. Replaces HP part number: Q3961A, 122A Cyan. Color Laser Toner Cartridge compatible with HP LaserJet 2550, 2820, 2830, 2840. Remanufactured HP Toner Cartridge, Magenta, 4,000 page yield. 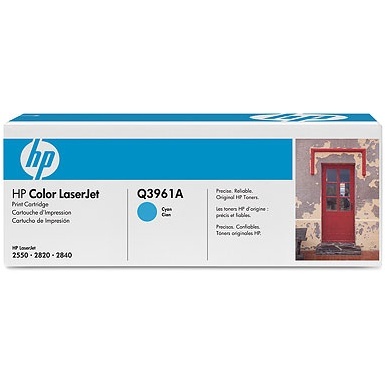 Replaces HP part number: Q3963A, 122A Magenta. Color Laser Toner Cartridge compatible with HP LaserJet 2550, 2820, 2830, 2840. Remanufactured HP Toner Cartridge, Yellow, 4,000 page yield. Replaces HP part number: Q3962A, 122A Yellow. Color Laser Toner Cartridge compatible with HP LaserJet 2550, 2820, 2830, 2840. Remanufactured HP Toner Cartridge, Black, 5,000 page yield. Replaces HP part number: Q3960A, 122A Black. Laser Toner Cartridge compatible with HP LaserJet 2550, 2820, 2830, 2840. Remanufactured HP Imaging Drum, 20,000 (black), 5,000 (color) page yield. Replaces HP part number: Q3964A. Imaging Drum compatible with HP LaserJet 2550, 2820, 2830, 2840.